Roulette is a game of chance where small ball moves around above red and black numbered slots which indicate potential winning numbers. Players are allowed to make bets and choose various numbers of the roulette wheel from 1 to 36. French/European roulette has 0-36 numbers on the wheel in comparison with American that has 38 pockets. There is additional green slot numbered 0; American roulette has an extra green slot marked 00. In order to identify the winning number and color, the dealer of the gambling table spins the wheel, throws the ball in opposite direction. It's Time to Play Roulette! Roulette is a casino game that was born and developed in France in 17th century due to the world gambling history. French inventor Blaise Pascal was working on the idea of perpetual motion engine creation but instead introduced a primitive alternative of a roulette wheel. Sometime after the roulette was invented it began to gain great popularity among the aristocratic and rich sectors of French society because of the beneficial house edge and excitement that it provided. In order to compete with existing gambling establishments and excel them in the quantity of regular guests and frequent customers Francois and Louis Blanc created a roulette wheel that contained a zero slot. This innovation was extremely favorable as it boosted the existing house edge leaving the game at the same level of popularity among roulette players. They introduced their novelty in Germany as far as gambling was prohibited in France at that time. 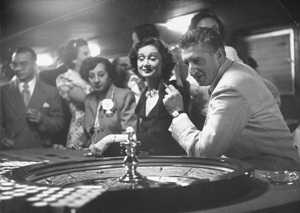 Following gambling games progress, roulette expanded its possession and conquered new lands and territories. In 1800s it travelled across the Atlantic Ocean and reached the United States. Simple rules and high payout rates were readily accepted by Americans with great enthusiasm. They even made an effort and diversified the game by adding the double-zero slot on the wheel, thus, maximizing the house edge. Spreading all over Europe during 1800s roulette became the most recognized and popular gambling game throughout the existing casinos and gambling centers. When German authorities banned gambling in the country Francois Blanc and his son Camille moved to Monaco and founded luxury - luxurious gambling house for the French and European elite. This laid the foundation for glamorous and glittering famous French gambling capital Monte Carlo (Monte Carlo is not in France, it is in Monaco). Fairy legend tells us that Francois Blanc bargained with Lucifer to receive the esoteric secrets of the roulette game. It is connected with the "Number of the Beast" - you obtain 666 when sum up all numbers of the wheel. In the mid-1990s roulette has entered the World Wide Web. Nowadays players from different locations even from the most far reachable countries have an opportunity to play their favorite game of both American and European variation of this adventure.